Hey, everybody! It's now the middle of May, 2012! 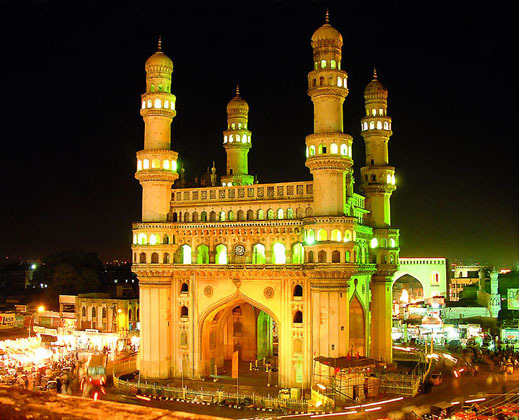 We've been here in Hyderabad almost exactly two full years! Still loving it, and loving it so much that we have opted to extend our stay in India for an extra year - now due to repatriate in June of 2013. The best part about being here is the travel opportunities we've had! As a matter of fact, we just finished another amazing, amazing trip!! This journey was actually planned by us long in advance as a "get away" trip for Amy after this years' tax busy season that ended on the 17th of April this year. She had a few things to wrap-up in Hyderabad before we could leave...but on Friday night the 20th of April, we were on our way to Bangkok, continuing on to Laos, Cambodia and Vietnam for two-whole weeks! I was just sitting here in our bedroom - flipping through the sports-channels on our satellite TV service here At Home In Hyderabad... instead of the steady-diet of IPL 20/20 Cricket we've been getting lately...Star Sports is televising the first-ever "Lao Open" golf tournament...and it's being played at the new golf course in Luang Prabang in Laos. Since we were just there (21 April through 5 May 2012) - the images being shown during a brief travelogue on the golf broadcast brought back lots of memories... Our first stop (after a brief stopover in Bangkok, Thailand with a minimal layover) was, in fact, Luang Prabang. They showed the Mekong River where Amy Suzanne dipped her feet (I think it was the exact spot where she hiked down to the river! ), the Kings Mansion and Museum, several Buddhist Temples, some riverside restaurants, the Night Market and the 328-step staircase that Amy climbed to the top of Phousi Hill... The more we travel, the more places we see on the TV where we have actually been. we are so totally blessed! As I said before, by far the best part of being here in India are the incredible opportunities to travel in this past of the world!! Laos was an unknown treasure for us. We book all our trips with the greatest travel agent you could ever hope for - Eve Wertsch from Fugazi Travel in San Francisco. We stayed at the Luang Say Residence in Luang Prabong. It was beautiful, we had our own private suite, the food was good and the Happy Hour prices made having a cocktail not quite as painful. There were also two new bunnies running around the garden. It all had a very French feel to it! We loved our guide - - on our first day he took us around to the Royal Palace (now the National Museum) - and we went to three beautiful Buddhist Temples: The Wat Visoun (16th Century), Wat Xiengthong (also from the 16th Century) and finally, Wat Mai. We had a nice lunch with our guide at L' Elephant restaurant - right on the bank of the Mekong River - where we learned all about the nuances of how to eat "sticky rice" After a return to the hotel to nap and freshen up, we went back out and walked around the setting up of the Night Market and Amy (not me, I had to save my knees for the 14-days to come!) climbed the 328-steps to the top of Phousi Hill to see the sunset. We returned to our hotel for dinner and calling it a very long, very hot and very humid day! 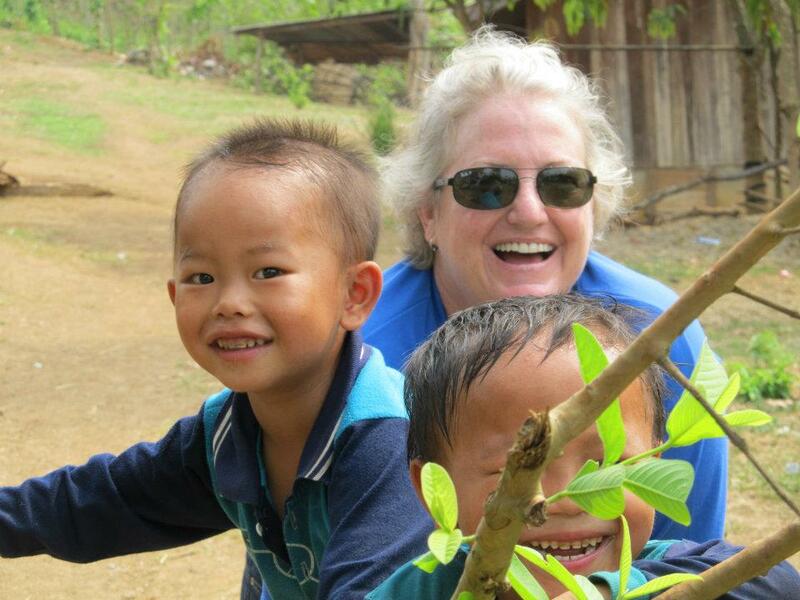 The second day in Laos was totally different. We enjoyed a drive out into the hill country, where most of the Hmong tribes still live in huts on stilts and weave cotton and process fresh tobacco for a living - something they have done for centuries. We made a stop at a school (see photo album!) - and them on to another village where we walked around (and sweat!!) and - then went into one of the stilted homes for a sit down (on the floor) lunch prepared by a local family. Now - you might not think that this would be the highlight of our trip to Laos...but it was!! The food was fresh, the company comfortable (although they spoke little English) - and our host was a man who liked to distill his own whiskey from rice... and he loved to share!! He served it into what looked like little jam-jars - poured from an old Johnny Walker Black bottle with a faced-to-grey label. He made sure our glasses were always filled! We then were told that the Laos custom was to take a little nap after lunch (after a filling lunch and half a bottle of rice-whiskey - no problem there, mate!) - so - we were provided with pillows and our own bamboo mats - and we snoozed for about an hour while the afternoon sky opened-up and it poured down all of the humidity it had been holding throughout the day! Thunder and lightning - it was perfect. We came back to the hotel to shower...then we went out to the night market...an incredible outdoor affair, very popular in this part of the world - where bargains abound! We got some t-shirts, some cool woven cups for sticky-rice serving...and - well... how do I describe this? We were at this lady's booth - checking out what she had...and Amy Suzanne spotted something among the wares for sale. "Oh, wow - that is so cool - what is it??" The lady explained that it was an ancient laundry basket - probably been in the family for 50 years... a beat-up old thing with a wood base and two old handles. "Is it for sale?? ", Amy asked. Well, of course it was. Needless to say, after the lady cleaned up the old basket by removing some baked-on sticky rice (I think she used it to carry her lunch to work - we had just purcheased somebody's lunch-box!) - we carried that beat-up old basket around Southeast Asia for the next two weeks!! It will be a very well-traveled laundry basket now, that's for sure!! We had a nice dinner at the Blue Lagoon (rated #1 in town!!) before taking a tuk-tuk back to the hotel for the night. We were already feeling the effects of the heat and humidity...it takes a lot out of you when you're walking around all day! Our final morning in Laos was spent "at leisure" (our favorite phrase on a travel itinerary) until we boarded a small plane for Siem Reap and Cambodia... More to come in Part Two - so stay tuned! In the meantime... here is a very small Facebook Photo Album from our time in Laos...the Internet connection was extremely slow - so - I didn't get around to uploading a bunch of photos from this part of our trip!